One of the greatest paradoxes we face upon entering an art gallery is the central position of belief and its suspension – the suspension of our inherently human system of justifications that accommodates and places us firmly in our daily world. Our faith is tested. It is the metaphysical and transformative power of fine art to communicate through social, political, personal, conceptual, theoretical and scientific means some understanding of events that destabilize us and engender dissent. As we engage with artworks and seek out meaning, the process of belief and its suspension has begun. In the case of Peter Hennessey: Making It Real, the concept of belief is of paramount importance. On display at the University of Queensland Art Museum, the exhibition focuses on four related themes that represent the ongoing artistic, scientific and cultural resources Hennessy employs as artistic strategies. Circumventing a uniform topography of circulation and consumption that threatens the current zeitgeist, this exhibition probes political power, the limitations of knowledge, corporate colonialism and technological fallibility [Littley 2015: 13–29]. Hennessey’s re-enactments of objects that have been cast adrift from popular consciousness into our constructed understanding of space and time, such as My Voyager , reference not only the real object but its global positioning as a strategic political resource. Not only does Hennessey collapse the space between objects, he also amplifies that space as representative of a range of inherent human desires. The enormity of the conversations and concepts engaged within this single work can be understood in relation to the 2012 crossing of Voyager I into interstellar space, making it the single most distant object in communication with humans. The exhibition is a career survey over the past ten years of Hennessey’s artistic output. The sheer scale of his sculptural re-enactments elicits a tacit reverence within the viewer. They seem strangely at home, sitting alongside photographs of variously staged, symbolic performances he calls ‘explosion events’. The artist’s hand is evident as we move through a series of maquettes and two channel videos embedded into various sculptural works, such as My Mission Control [The act of observation changes the object observed] 2005. As viewers, we become immersed in Hennessey’s hypnotic collapsing of time and space. And yet there exists an almost palpable melancholia in the overt representation of the space that exists between the human and a represented technological utopianism, a melancholia that animates the space that exists between a desire to ‘know’ and the inordinate limitations faced in the pursuit of that knowledge – the space between the image and experience and the space that exists between our real selves and a projected sense of self. In many ways it is this underlying tension of competing spaces within Hennessey’s work that drives a discourse through the authenticity of lived reality towards an overt representation of a life consumed by simulacra. Hennessey’s art creatively navigates the four-part structure of Jean Baudrillard’s thesis surrounding simulacra and simulation [Baudrillard 1988: 166–84]. However, while threading its way throughout this oftentimes complex and demanding set of parameters, Hennessey can be seen very much to favour the first of Baudrillard’s precepts, namely the ‘sacramental order’, where his unerring re-enactments encourage us to believe that they are a sign, a reflection of a profound reality. On the other hand, in Hennessey’s work the signifier and that which is being signified are both interchangeable as forms of cultural currency, infinitely turning on each other and expanding the work’s inherent artistic precepts. This film accompanies the major exhibition ‘Peter Hennessey: Making it real’ at The University of Queensland Art Museum (14 March – 12 July 2015). The exhibition reflects on the past decade of Hennessey’s practice. Trained as an architect, Hennessey has established an international profile for his physically imposing, conceptually rigorous sculptures. He is inspired by the science of space exploration and comparable technological advances, and scours the Internet and other publicly available information to produce his work. The resulting sculptures are ‘re-enactments’ of objects that allow people to encounter in three-dimensions what they would otherwise only see in reproduction, or on the Web. ACMI presents the world premiere of Star Voyager: Exploring Space on Screen, a major exhibition charting the history and future of space exploration as experienced through the moving image. Australian artist Peter Hennessey talks about his creative process and the works he has contributed to ACMI’s Star Voyager exhibition. In Hennessey’s ‘explosion events’ such as My Burnt Frost [Explosion event I-IV] 2008, it is clear that what we are experiencing is an extension of the artist’s fascination with time and space. 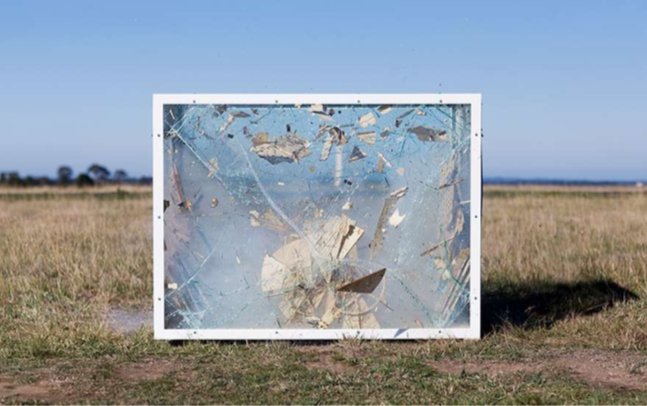 The third image in this series is an exploded maquette, which is frozen and immoveable within a confined, clear structure that lacks oxygen and is strategically placed in what looks to be a recently harvested wheat field in rural Victoria. Looking at the image, the relationship between the internal and external realities of objects or environments becomes visually, inextricably symbiotic and fixed as holding an equivalence of intent; essentially they are the same thing. Hennessey’s visual literacy is foregrounded in these photographic works that like the sculptural, video and maquettes, capture heightened moments in time and allow us to explore the conceptual, moral and ethical relationships between our institutionalised selves and our universal environment. As a society do we too eagerly monumentalise that which we value? Or are our values culturally or corporately based? Regardless of our ideological responses to Peter Hennessey: Making It Real, what can be appreciated is the rendering of these intricately precise artworks. They explore territories of phenomenological implication, territories that arouse a compelling insinuation of our future selves. While Hennessey’s conversation is clear and visually coherent, the works prompt unanswerable questions. This is an exhibition that reverse engineers the conceptual framework of its four-part premise. Meticulous, obsessively brilliant, as well as conceptually solid, it achieves, on a grand scale, that which others might only dream. 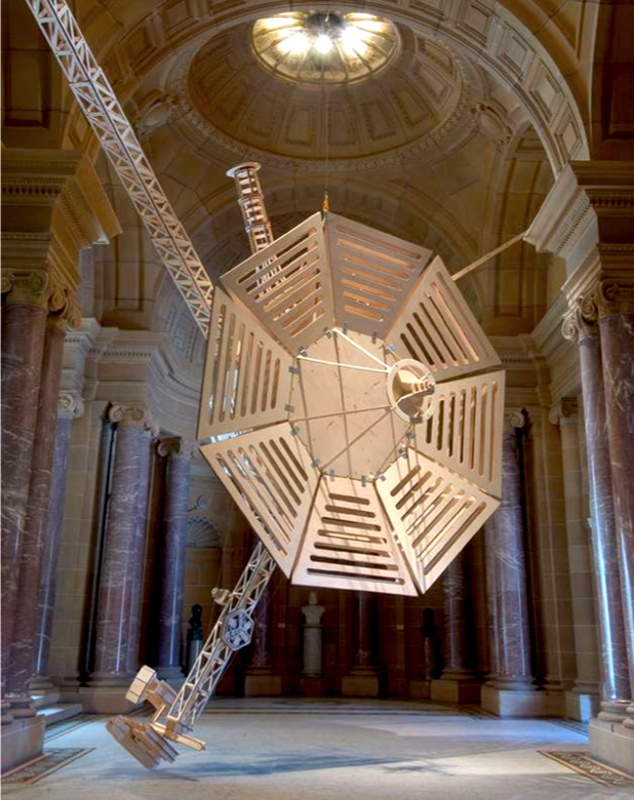 Peter Hennessey, My Voyager, 2004, plywood and steel, 650 cm (h), Westfield Centrepoint Sydney, UAP, 2013, Image courtesy Rodger D’Souzer. Littley, Samantha (2015), Peter Hennessey Making It Real, The University of Queensland Art Museum. Baudrillard, Jean (1998), Selected Writings (ed. Mark Poster), Stanford: Stanford University Press.